We're currently focusing on Loads with Alexis and I have just released the first version at PyPI. It's a distributed load testing tool. It's still at a very early stage but I think it's worth releasing it to share it with people that might be interested in doing heavy distributed load testing. If you want to give it a shot, install it , then follow the guide here: http://loads.readthedocs.org/en/latest/guide and let us know what you think. Beware that it's an early prototype, probably still full of bugs. 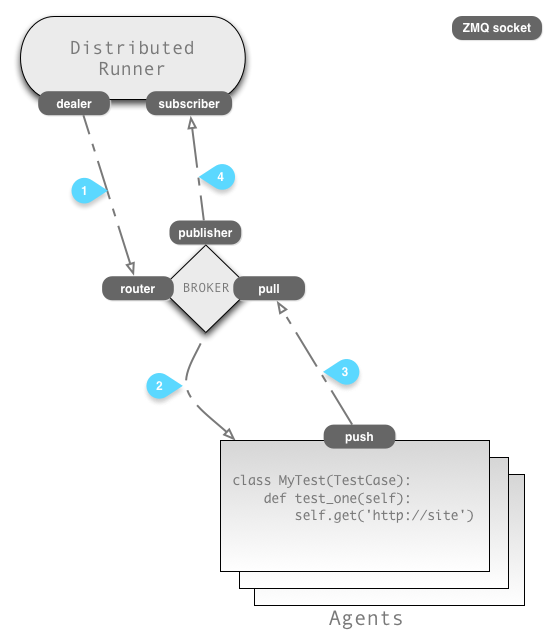 Loads uses a ZeroMQ Broker that drives several Agents to run tests. Tests results are sent in real time into a publisher. The Loads program sends a message to the broker, asking it to run the tests on N agents. The broker selects available agents and send them the tests to run. When a test is done, whether it has failed or succeeded, the agent sends back to the broker information about what happened. Right now, we've deployed Loads on AWS on several boxes, and started to use it to load test a few of our applications we're currently building at Mozilla Services. The long term goal is to offer a load testing service to our team, so anyone can send huge loads on a staging or dev application with a simple command line call. I hope that we will have something that works well by the end of the summer and be useful to more people than our own team.